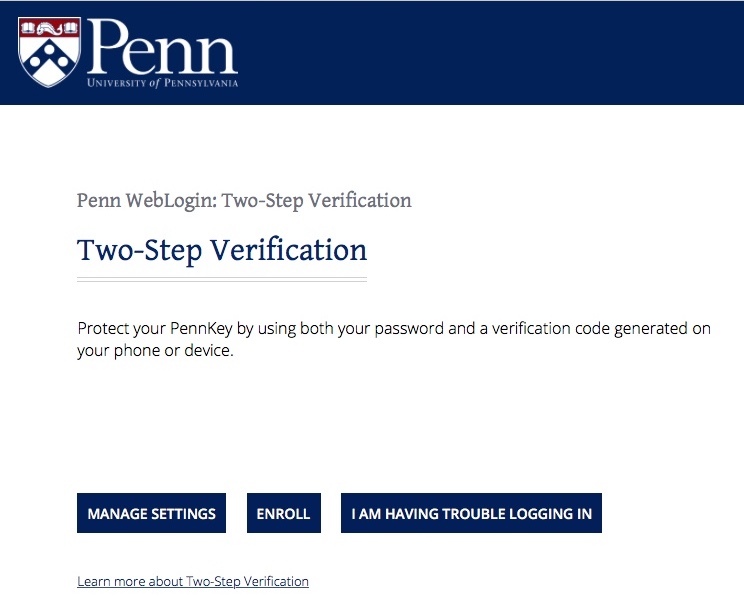 For a more general guide, consult Two-Step Verification: getting started. 3. 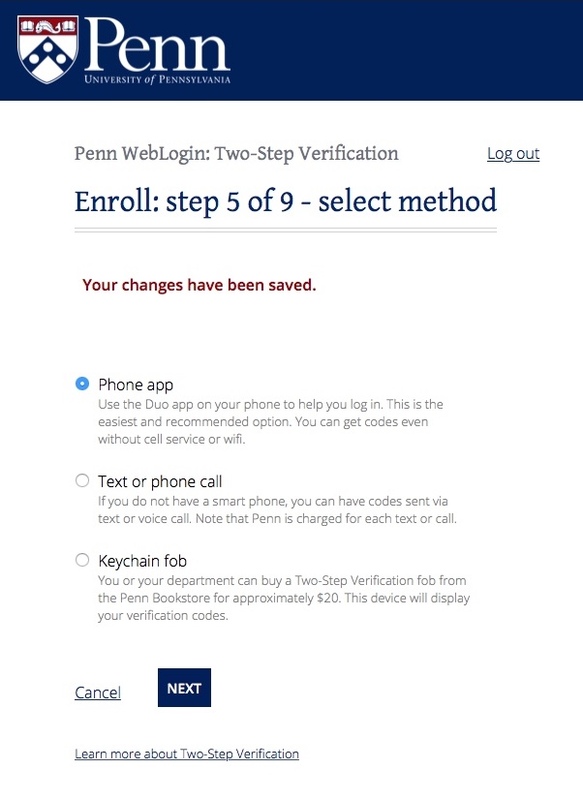 At the Penn WebLogin screen, enter your PennKey username and password, and click Log in. 4. 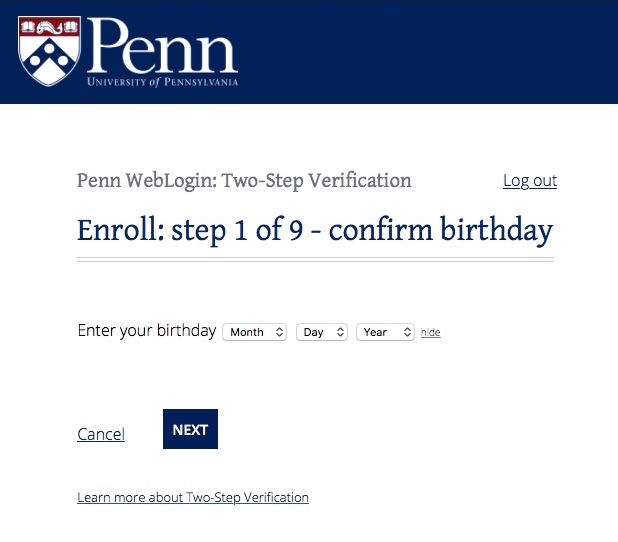 At the Enroll: step 1 of 9 - confirm birthday screen, select the month, day, and year of your birthday with the dropdown menus, then click Next. 5. 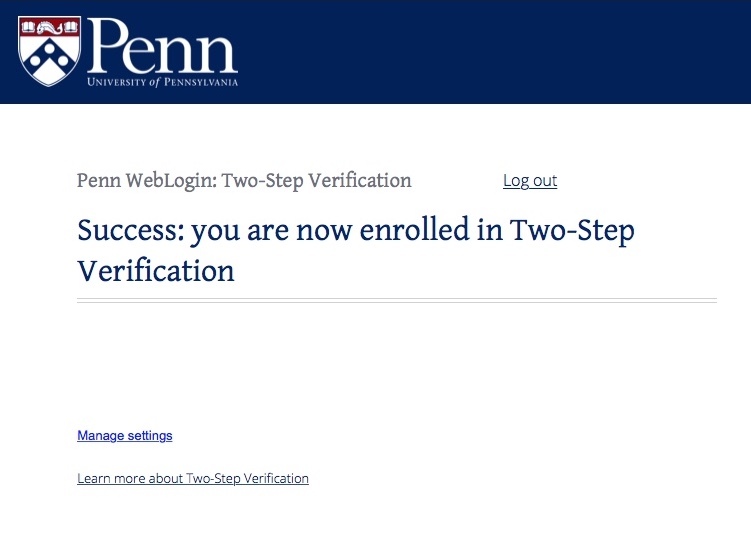 At the Enroll: step 2 of 9 - email screen, verify your Penn email address and click Next. If your Penn email address is incorrect, you can correct it later through Penn Directory update listing. 6. At the Enroll: step 3 of 9 - phones screen, enter contact phone numbers. These phone numbers are one of your lifelines, and you can receive an SMS text (mobile) or phone call (mobile or landline) to receive your code. For each number, choose to receive text, voice, or both. For international numbers, enter the number in the appropriate format, starting with the plus (+) sign, country code, any required city or region codes, and telephone number. Click Next. 7. 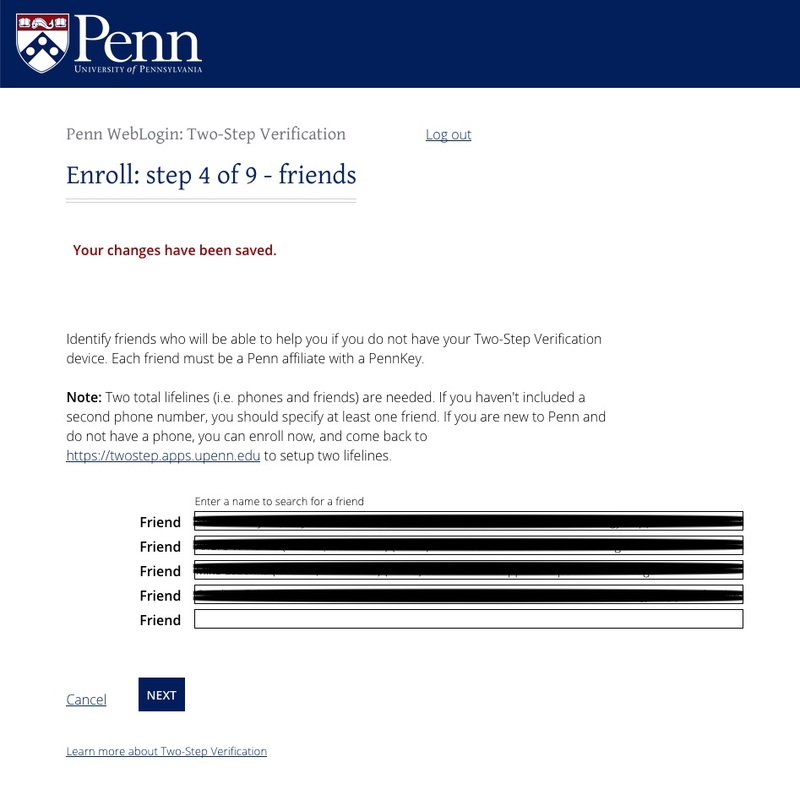 At the Enroll: step 4 of 9 - friend screen, select one or more Penn-affiliated friends. These friends are lifelines who can help you to access your account if you lose access to your verification device. Click Next. 8. 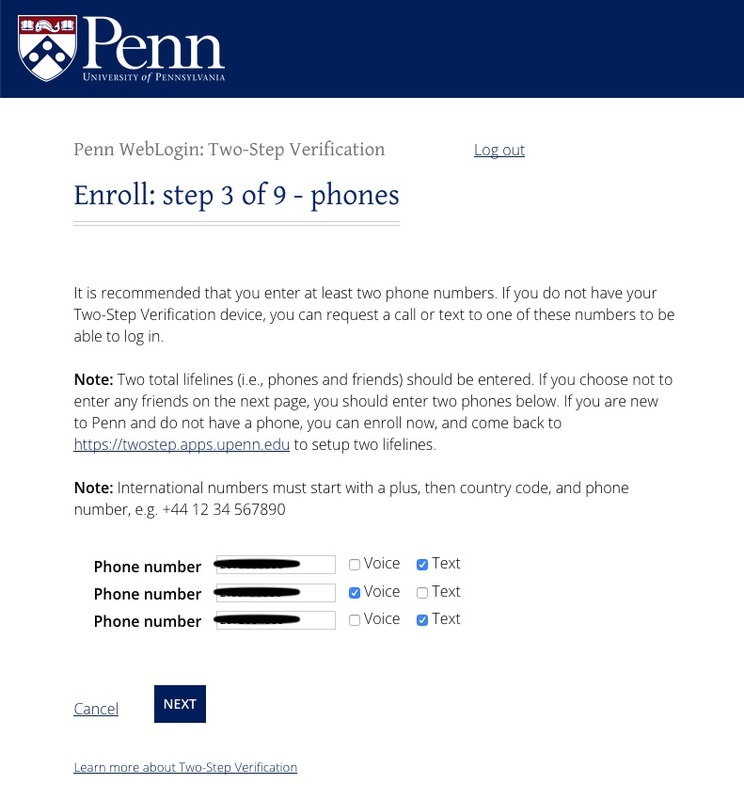 At the Enroll: step 5 of 9 - select method screen, select your second verification step. You can choose from a phone app, text or phone call, or keychain fob. Skip to step 10 for text or phone call instructions. Skip to step 11 for keychain fob instructions. 9. Phone app - Duo. Duo Mobile is a two-factor authentication application which provides a second step authentication service to protect against account takeover and data theft. Duo Mobile is a free app which is downloadable from the App Store (for iOS) or Google Play Store (for Android). Duo Mobile is highly recommended as the second method of verification. 9a. Select the Phone app radio button and click Next. 9b. Ensure you have downloaded Duo Mobile from the App Store (iOS) or Google Play Store (Android), then click Next. 9c. 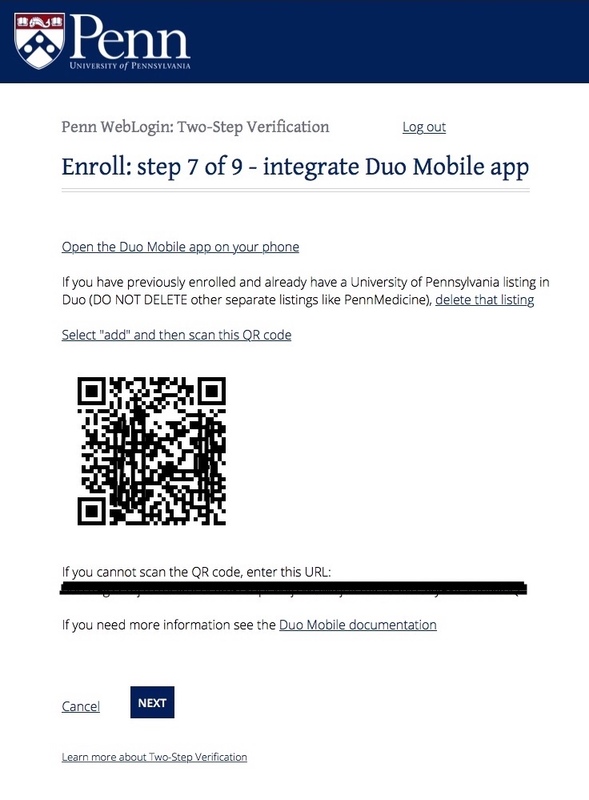 On the integrate the Duo phone app page, note the scannable QR code that has been generated, then launch the Duo Mobile app on your device. 9d. On your device, tap Add Account (if you have no other profiles) or the plus (+) sign (to add an additional profile to already existing Duo profiles), and point your device's camera to the QR code on your screen. 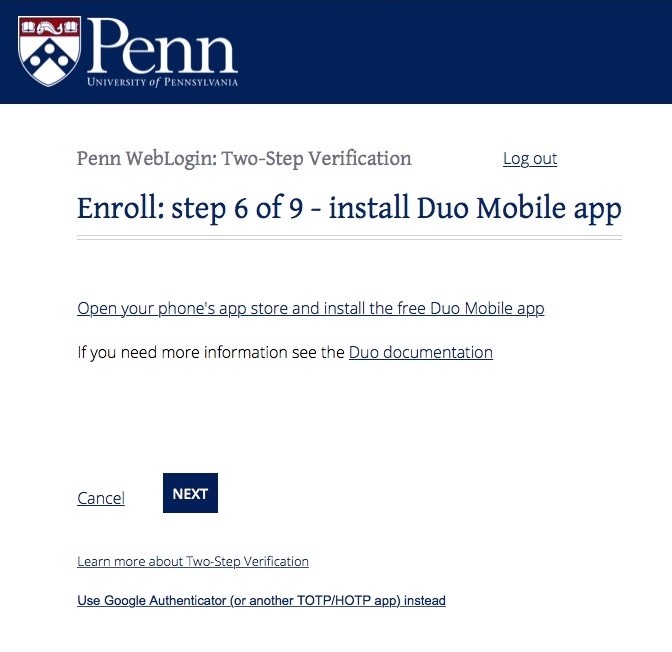 The Duo-Protected University of Pennsylvania account appears in your Duo Mobile app. Click Next. 9e. 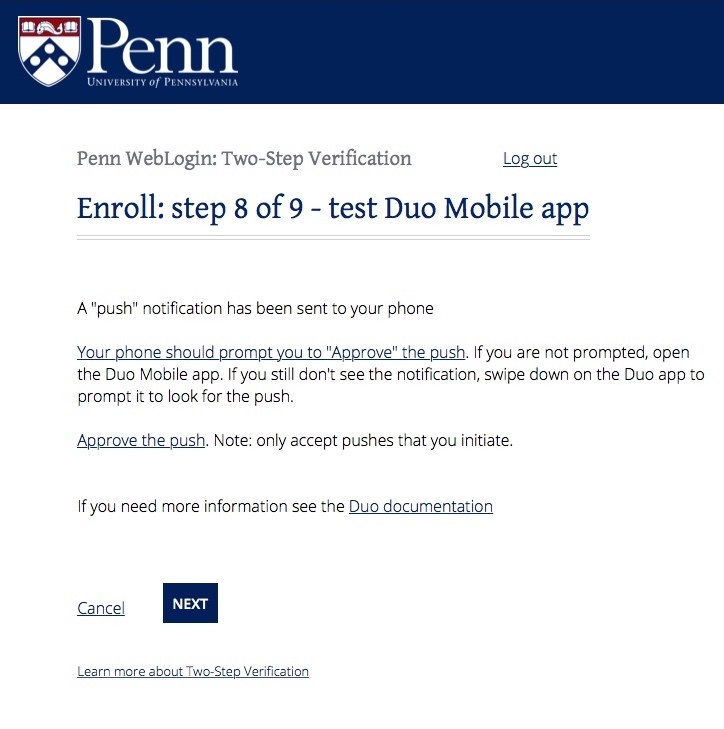 In the Enroll: step 8 of 9 - test Duo Mobile app screen, a test push notification is sent to your phone. Tap the notification on your Duo Mobile app and tap Approve (the check mark) to accept the test push notification. STOP! Before proceeding any further, make sure to accept the test push notification on your smartphone! Once you have done so, click Next. 9f. Skip to Step 12. 10. Text or phone call. 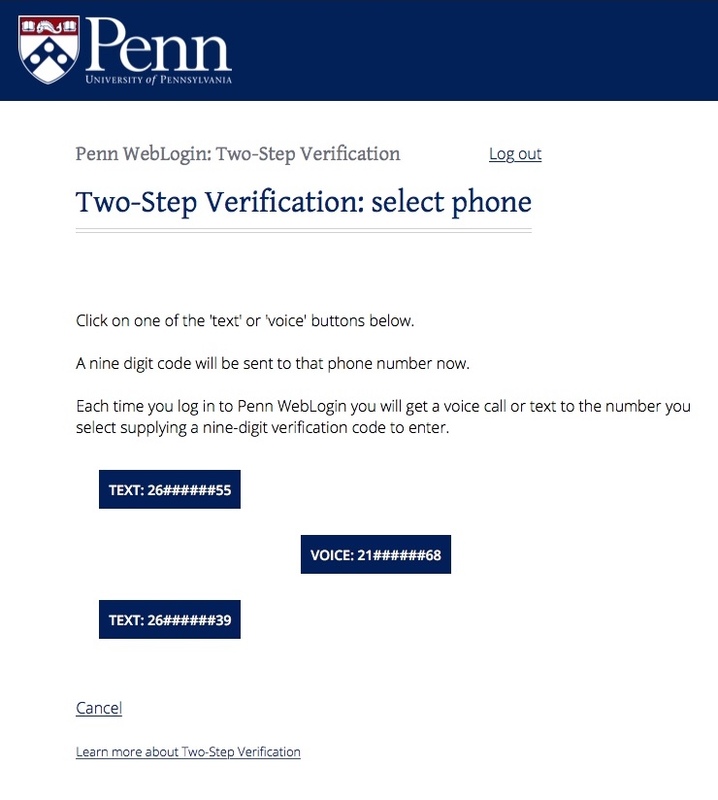 Select this option if you do not have a smartphone and would like the Two-Step Verification service to either text or call you to provide a verification code to one of your registered phone numbers. 10a. Click one of the Text or Voice buttons for the phone numbers you entered earlier. A nine digit code will be sent to the phone you select. 10b. 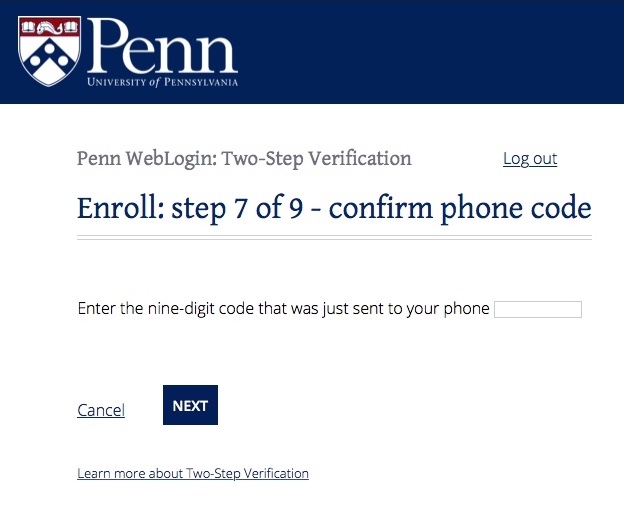 In the Enroll: step 7 of 9 - confirm phone code page, enter the nine digit code that was sent to your phone. Click Next. 10c. Skip to Step 12. 11. Keychain fob. Select this option if you wish to register a fob that will display Two-Step Verification codes. 11a. 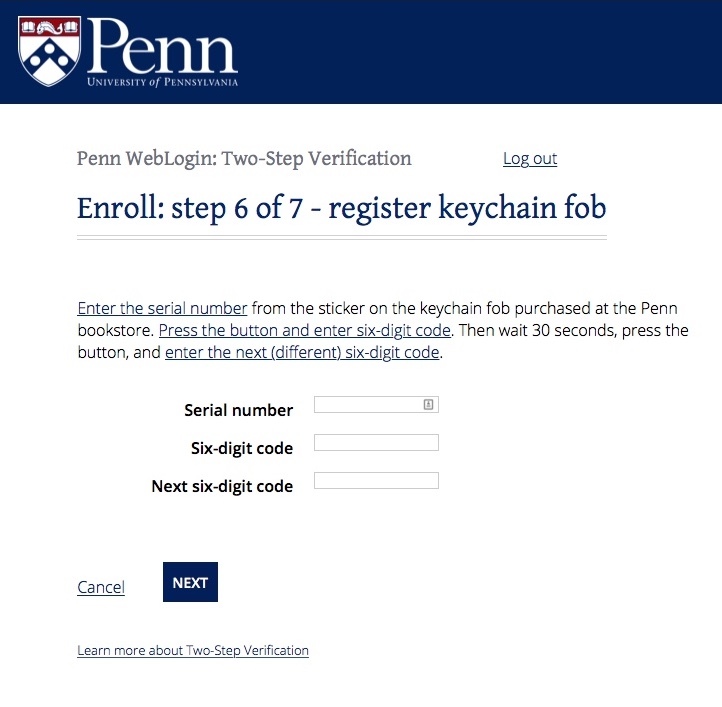 In the Enroll: step 6 of 7 - register keychain fob screen, enter the serial number from the keychain fob purchased at the Penn bookstore. Press the key fob's button and enter the six digit code in the first six-digit code field. Wait 30 seconds, and press the key fob's button again, and enter the next code in the next six-digit code field. Click Next. 12. 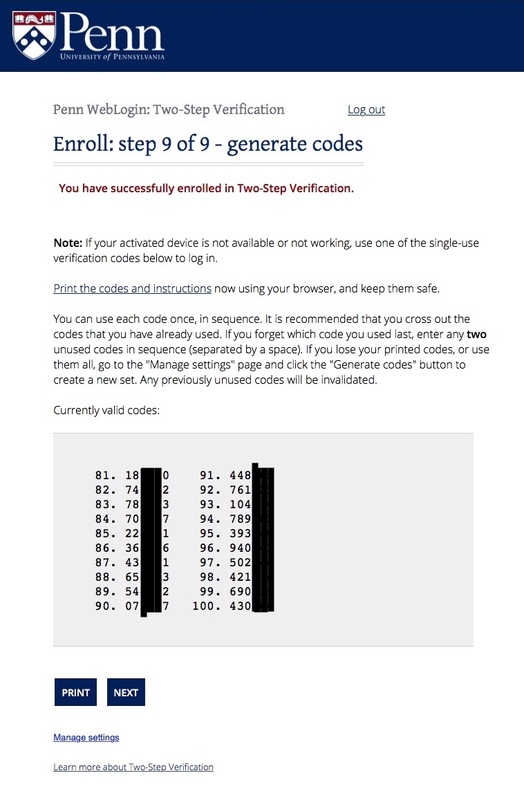 In the final Enroll: step 9 of 9: generate codes page, you'll see the message "You have successfully enrolled in Two-Step Verification." A list of valid codes is shown--print these codes and keep them in a safe location. These are one-time use codes for you to use in order, in case you don't have access to your verification device. Once you use a code, cross it out from the list. Click Next. 13. 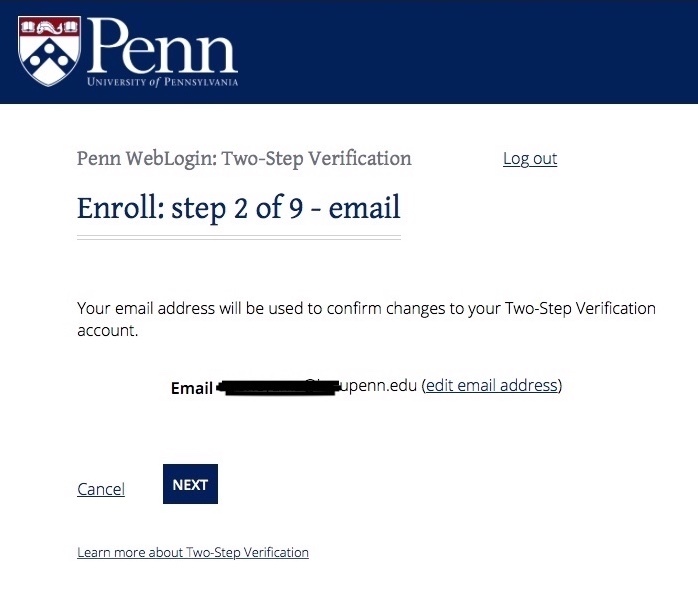 You have successfully enrolled in Two-Step Verification. NOTE: If you need to make changes in the future to your Two-Step Verification profile (e.g. add or change friends or phone numbers, generate more one-time codes, etc. ), go to the Two-Step Verification enrollment page and click Manage Settings.